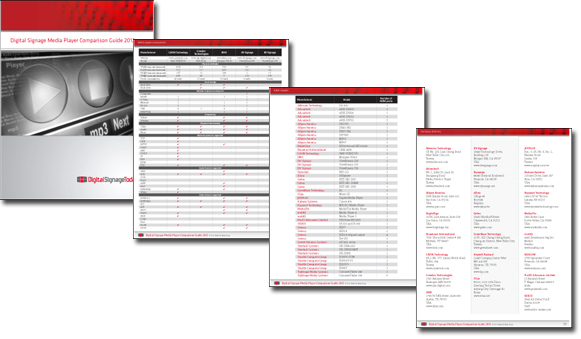 All new for 2012: We did extensive research on more than 50 different media players from 28 manufacturers. For each unit you’ll find out the hardware specifications, connectivity options, software capabilities and more – and they’re sorted into easy-to-use lists that help you find the exact model you need based on some important options. And if you see one you like, we have a directory with contact information at the back of the report. While much attention is paid to the selection of digital signage screens – and rightfully so – it can be easy to leave media player selection almost as an afterthought. But the media players you select will serve as the intermediary between your content’s creation and deployment, and its ultimate home on-screen. Functionality varies widely from unit to unit, and this is not a piece of hardware you’re going to want to repurchase every few years.